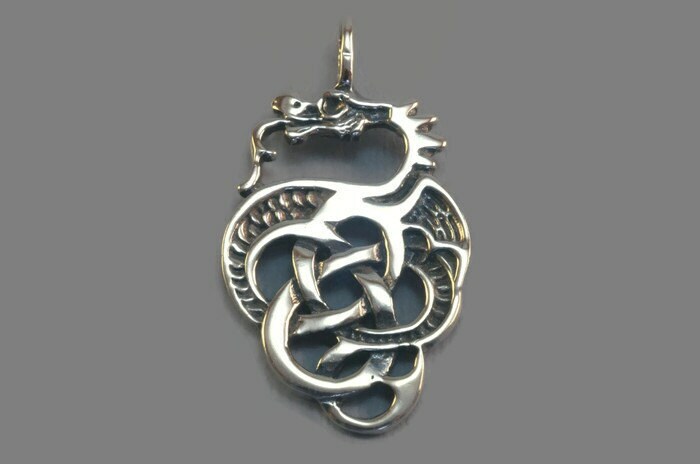 This one of my favorite dragon pendants I make in sterling silver. It's 4cm high, and the bail on it is large enough to pass a medium chain. I guess you can say it's a unisex pendant! In the area I live in there is a large irish population, and when I started making jewellery there was no one making Celtic jewellery in our area. So I decided to do that myself! This is one of my signature pieces in my shop, due to the fact everyone recognizes me for producing it. The original design comes from the 50'same, but bought a brass master along with many others I make in my shop, from a production shop that closed in 1998. I do my own production in my shop. A really beutiful piece and reasonably priced! Beautiful work. I can't thank you enough. Great communication as well and quick shipping. Beautiful pendant, but not as heavy-weight as I expected. Delivery was quite fast, despite having to travel far.